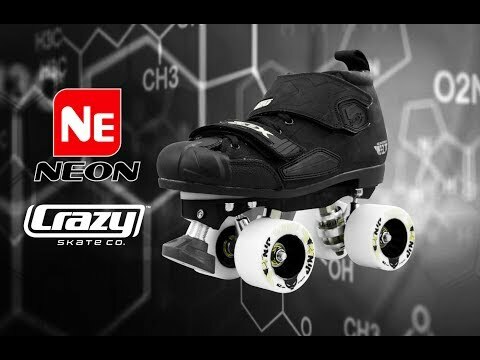 The Crazy Skates NEON package is the super affordable introduction to the Crazy Derby lineup. Featuring the time tested DBX 5 full grain leather boot with a number of patented features for ultimate support, the industry leading APOLLO composite nylon/fiberglass plate and fitted with QUAKE speed wheels. Don't bother looking for a higher spec'd skate at this price. You won't find one. The DBX 5 leather boot returns to the Crazy Derby line-up with three layers of toe protection PLUS a wear resistant toe cap. This new toe cap, has been specifically designed to be non-marking and highly durable - Protecting your toes as much as your skates. To further enhance your skating experience, the DBX5 boot offers one of the highest levels of support and level of heat moldability of any boot on the market. The superior materials used in the boot construction along with the significantly greater area around the heel and arch of the foot that can be custom moulded, provides each skater with a level of support that is unprecedented. This support system and HLT (Heel Lock Technology) is helping skaters by keeping their feet aligned and comfortable while offering your toes, ankles and arches the support and protection they need. Keeping feet aligned and supported is not a pretty subject to market and advertise, but we happen to think that is the most defining feature of any boot. Like the strength of any building, you look to a solid foundation - your skates are no different in this respect. Once your feet are correctly seated in a boot and that boot supports your ankles and promotes and aligns your center of gravity through the distribution of your weight through arch support, heel lock and a variable toe box, you have all of the elements to promote an effective and efficient skating technique. The DBX boot is one of the few skating boots on the market today to achieve this. This is just part of the reason that the NEON package is considered the best value, feature packed skate package on the market at the moment! If you think you might like to upgrade in the future, we have a range of options from lightweight kingpins, to colored VENUS plates and trucks to high rebound cushions. This can all be done with minimal tools and no re-mounting. The perfect starting skate to build your skating future. No matter how or where you skate, the NEON package has the support, durability, science and versatility to take your skating to the next level and beyond. The Crazy Skates DBX range are a family of performance boots specifically designed for the modern roller derby game. Subtle changes in each model cater to the personality and style of the individual skater, the pinnacle of which is the entirely custom DNA custom DBX boot a totally unique expression of your personality. Each and every DBX boot is built with a signature set of features that give these skates a distinct performance advantage that must be felt to be believed. If you believe that aching feet, tingling toes, black toenails, blisters and calluses are all an unavoidable part of skating. You haven't tried a DBX yet. No matter how or where you skate, Crazy DBX Skates have the support, durability, science and versatility to take your skating to the next level and beyond. To enhance your skating experience, DBX boots offer some of the highest levels of support and highest level of heat mould ability of any boots on the market. It is essential to keep your feet balanced and supported evenly across the whole of a skate boot. This way, you are not exerting pressure on any one part of the boot to achieve an overall result you can use your whole foot to control your skating movement. No single feature can create this feeling in a boot. So, to achieve this, a number of patented features within the DBX boots work together simultaneously to provide skaters with a complete level of support. The Genius of the DBX boot construction is that it is lined with a rigid internal structure of ABS counters. These counters come to life when heated, becoming totally pliable so that you can wrap the boot around your foot and set it to the exact shape you need. These counters then set, leaving your boot solid and supportive but in the shape of your foot. A totally custom fit! This gives you a boot that fits like a second skin, spreading your body forces across the largest possible surface area within your boot. This all but eliminates the many discomforts associated with skating boots. This process of heating and setting your boot into shape can occur countless times, to adapt to your changing needs and progressing skating techniques. For those who have been told that they need a custom boot for their strange feet, DBX boots can be made extremely narrow or extremely wide, or both. The only fixed parameter is the length of the boot, everything else can be formed for YOUR feet. When deciding to invest in a boot that actively supports your body, you are making a choice for stronger skating, higher levels of performance and better health in the long term. You want that investment to last you the distance this is why the DBX range are built with added reinforcement in all the places necessary to keep your skates lasting for years. We only manufacture with the highest quality latex memory foam in our DBX range, meaning that your skate will fit the same, year after year without sagging or flattening. Our heat mouldable ABS material never breaks down in the presence of sweat like the cardboard counters that give other skates their stiffness. To put it simply, your DBX skates will never end up looking like the old worn out leather boot. In short, Crazy Skates DBX Boots are bulletproof performers that Derby players worldwide trust to carry them through bouts and tournaments, year after year. No matter how or where you skate, Crazy DBX Skates have the support, durability, science and versatility to take your skating to the next level and beyond.